The Dardé family has worked this land on the edge of Lake Octon Salagou in Languedoc for several generations, cultivating sheep, olive trees and vineyards. In the 1960s general farming was abandoned in favor of vineyards. Guilhem, the present owner, joined his father and uncle working in the vineyards in 1974; at this time, the grapes were sold to the village cooperative. 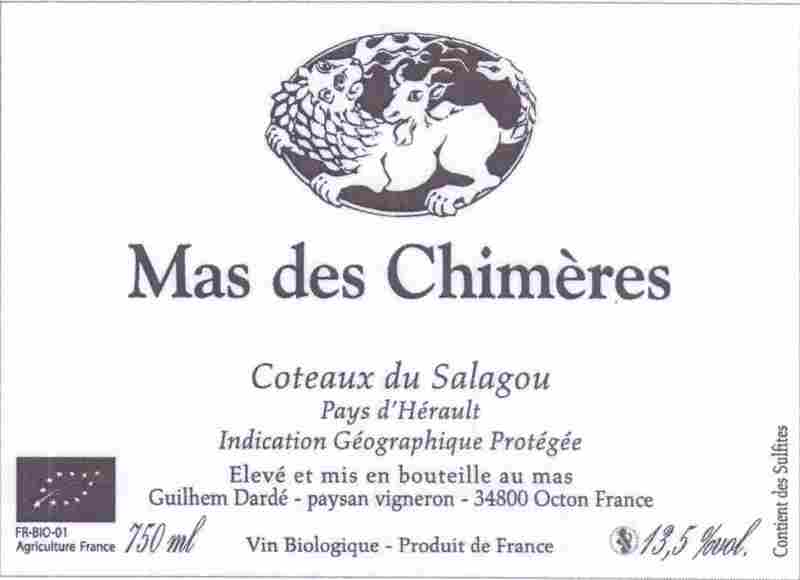 In 1993 Guilhem moved into private cellar and created Mas Chimères. His wife, Palma, began working with him steadily starting in 1996; Maguelone, her daughter, joined in them 2008 after extensive studies. Early on the desire to capture the expression of terroir had led the family to abandon the use of all harmful chemicals and pesticides at the vineyard. The vineyards went thru the certification process in 2008 and are now certified organic.